New members of OGIDiscounts.com can decide to be either Customers or Customers & Representatives. 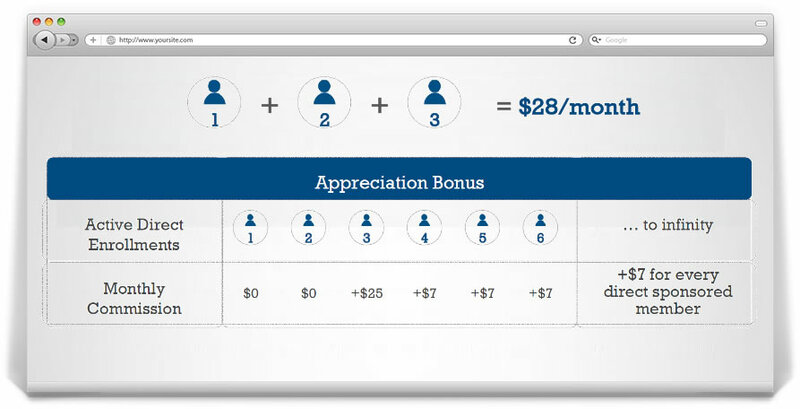 Only Representatives are eligible to get the bonuses described in this Pay Plan. Every Business pays $160 in order to purchase the OGIBiz Platform for a year. 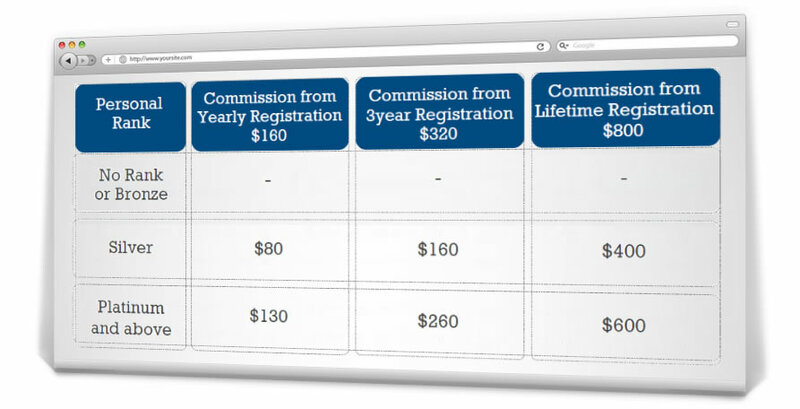 Members that register new Businesses get Affiliate commissions depending on their Rank. 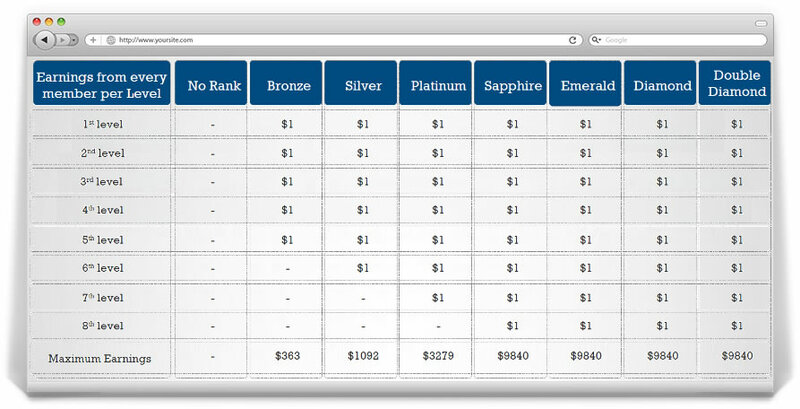 So, for example, if a member has the Silver Rank, they earn $80 for every Business they register, while if someone is Platinum or above, they get $130 direct commission. Depending on a member's choice of subscription and their personally sponsored active members a Personal Rank is awarded. This affects various payment bonuses in the compensation plan. Members choosing to start or upgrade during their first month to the quarterly subscription are automatically awarded the Silver Rank. All monthly or quarterly members who choose to upgrade to an annual membership during their first subscription, as well as those who start with the annual subscription are awarded the Platinum Rank. After the expiry of their first subscription, their upgrade will Not affect their Rank. As a member helps their team grow they unlock Team Ranks. These will add additional bonuses that stack with all previous ones. By having just three active members personally enrolled, our members become FREE and their monthly membership is paid by their profits. For every active member that they have sponsored after the 3rd, they receive a monthly commission of $7. When you lock in your position in OGIDiscounts.com, you are given your own business center in our fast filling 3x8 Matrix! As more people join OGIDiscounts.com every week, they are placed in the Matrix UNDER someone who already has a position. So the sooner you lock in your position, the higher your position will be in the Matrix. As soon as someone fills a position in the Matrix, three direct positions become available under them; these can be filled by themselves or by one of the members above them. They can receive a Matrix Bonus down to a maximum of 8 levels. 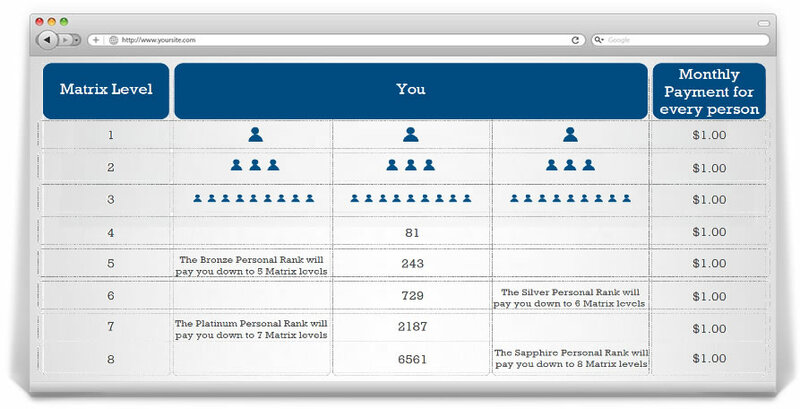 Every position in their Matrix filled by an active member, pays them $1 Matrix Bonus / month. On top of the Matrix Bonus that our members can earn from their personal Matrix, they also have the ability to match up to 50% on the Matrix Bonus of everyone they enroll, regardless of where they fall in their Matrix! 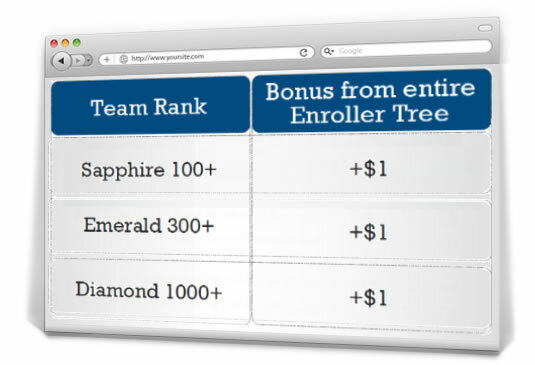 Sapphire 100+:Reaching this rank, a member is paid an extra $1 for every active member in their enroller tree until another Sapphire 100+ is found. Emerald 300+: Reaching this rank, a member is paid an extra $1 for every active member in their enroller tree until another Emerald 300+ is found. Diamond 1000+: Reaching this rank, a member is paid an extra $1 for every active member in their enroller tree until another Diamond 1000+ is found. * Leadership bonuses apply to an enroller tree and are Interrupted only when another Leader of the same rank qualifies for the bonus. Members that have a team consisting of 20 active direct members and an Enroller tree of over 300 members, are eligible of a car bonus starting from $300 up to $1000 / month for as long as the car bonus requirements are met. Each individual enroller tree leg, can not contribute more than 100 members to the sum needed to qualify.